I’m very excited that October has arrived and my decor can shift from fall to Halloween! We all know that Martha is the Queen of Halloween, so when I had the chance to get my hands on some Martha Stewart Decoupage fit for spoooooky Halloween Crafts I just couldn’t say no. 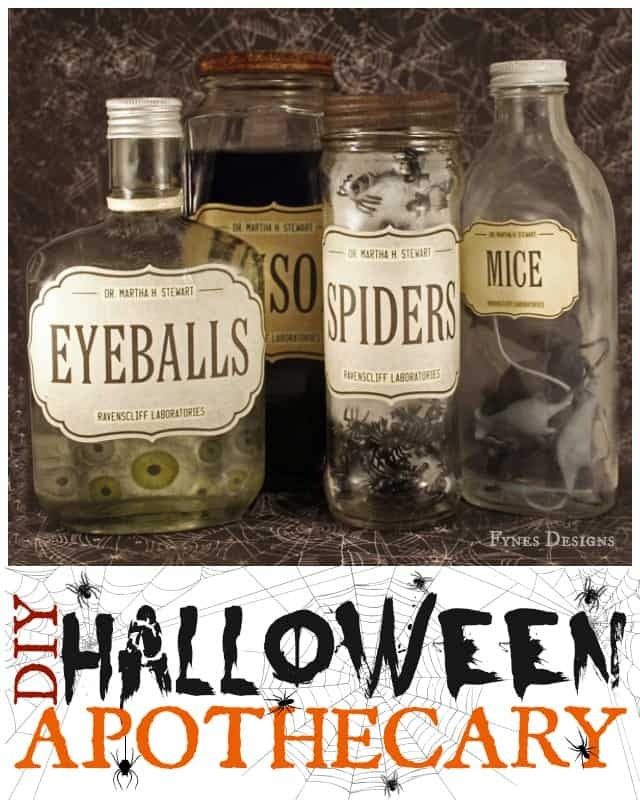 You’ll be so surprised how easy it is to create these Apothecary jars that you’ll consider opening your own festive pharmacy! I found this a great assortment of glass jars at a yard sale, just begging to be given a new purpose! 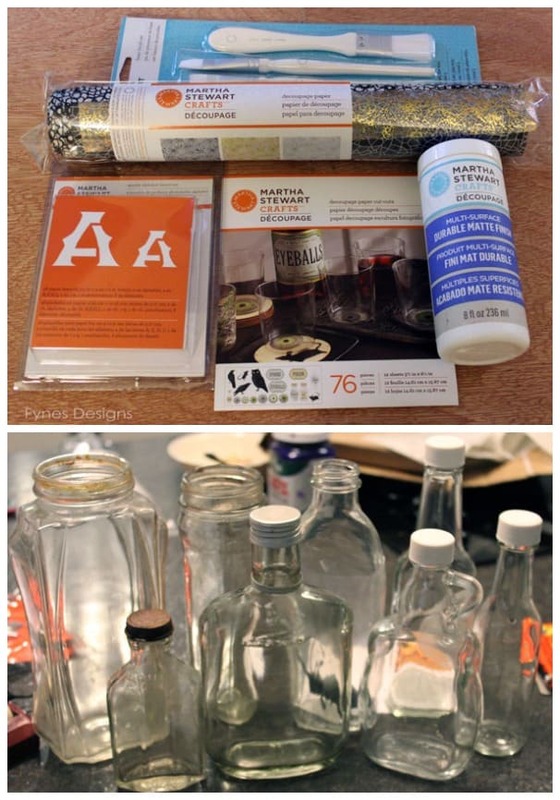 This decoupage project really is as easy as 1-2-3! 1. Prep your bottles. 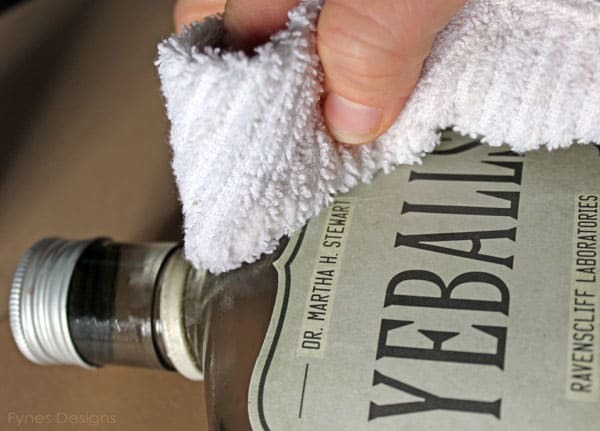 Give a good wash, and a rub with alcohol to remove any residue. Punch desired labels from your Martha decoupage paper-cut outs. 2. 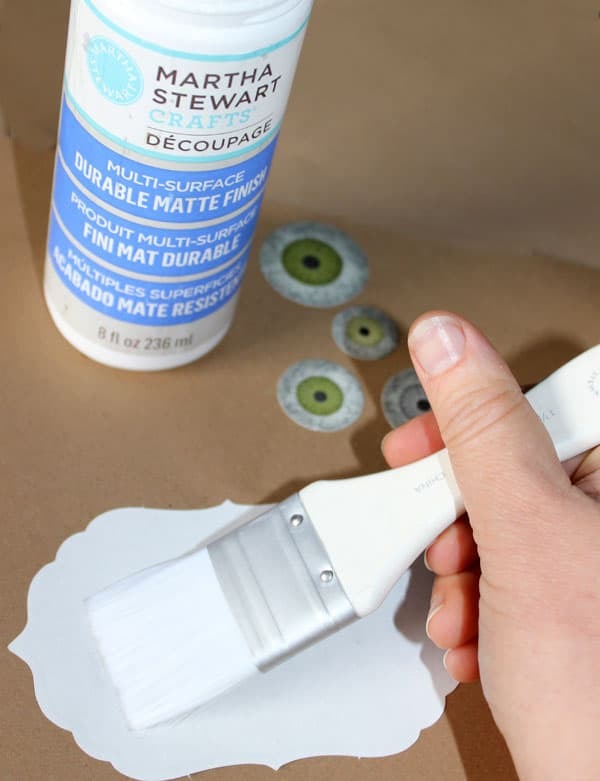 Using Martha Stewart Multi-Surface Durable Matt Finish decoupage medium, brush a thin coat on the area you intend to stick your label. On a scrap paper lay your label face side down and brush a thin coat on the back. Apply the label. 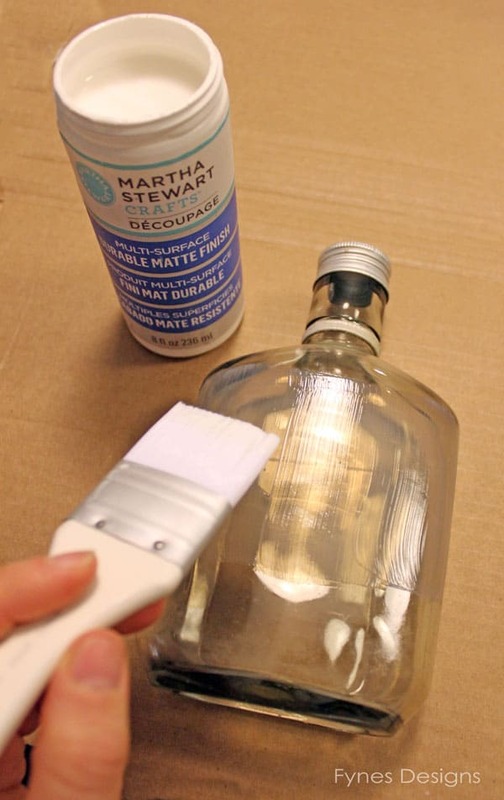 Brush directly over the label with a small amount of finish (*a little goes a long way*). 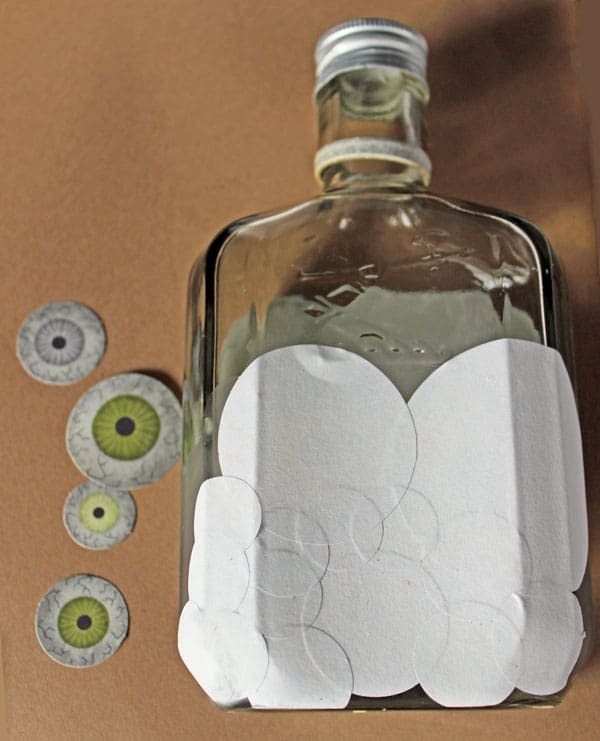 To make the bottle look like it contains eyeballs, I applied the decoupage medium to the front side of the eyeball cutouts and overlapped them on the back of the bottle. 3. Using a damp rag, wipe excess medium off of the bottle, as close to the label as possible. Allow to dry approx 3 hours or overnight. Fill your bottles with creepery and get working on your spells! 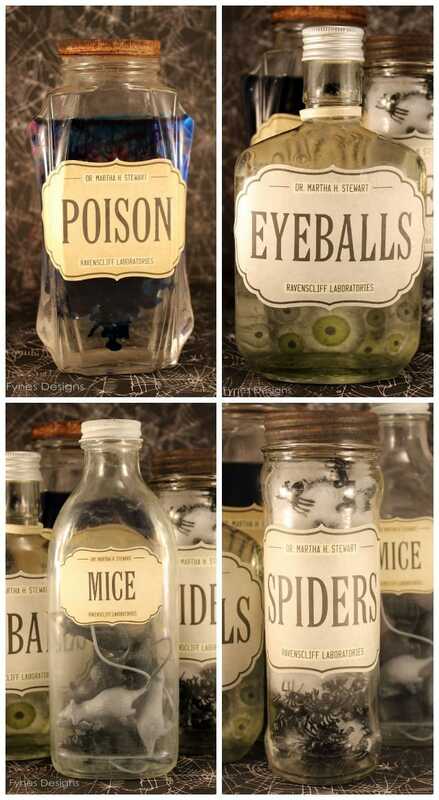 I used water, food colouring, dollar store bats and spiders to fill my jars. The decoupage medium is dishwasher safe, machine washable, non-yellowing, drys hard with no tack, can be used indoors or out, and is available at Michaels. 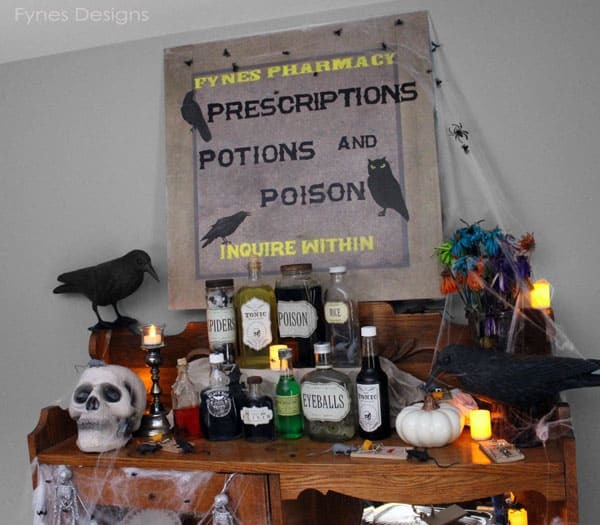 Fynes Pharmacy is your one stop shop for prescriptions, potions, and poison! Disclosure- This is a sponsored post. The ideas, photos, and opinions expressed are my own. For more halloween inspiration and ideas join me on Plaid’s Facebook Page and Pinterest page. I’m not the only one gearing up for Halloween with Martha, check out the other creative projects below. See, this is what I get for not checking my email on time. I would have LOVED that set! What a great job. Totally envious. I want to steal them all. Love these! What a great halloween display! I love these jars! I’ve been wanting to make some of these for awhile now. 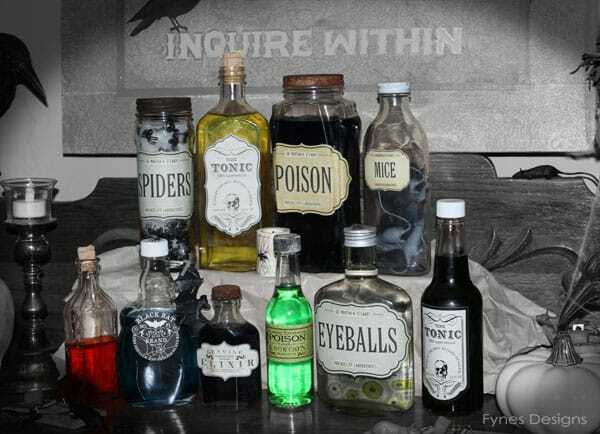 Great to see all the creative ideas all of the #MSHalloween bloggers have come up with! Happy Halloween! Many Halloween decorations tend to be pretty tacky, but I really love this. It’s in the spirit of things, and it’s very classy. Thanks for sharing! I can’t wait to try this. THanks Tess! I agree on the tacky, its such a short season that you really need just a few statement decorations! these are so cool! you did a great job – thanks for sharing!